I. Codifications and further developments of existing religious traditions provided a bond among people and an ethical code to live by. A. The association of monotheism with Judaism was further developed with the codification of the Hebrew Scriptures, which also reflected the influence of Mesopotamian cultural and legal traditions (i.e. Zoroastrianism). The Assyrian, Babylonian, and Roman empires conquered various Jewish states at different points in time. These conquests contributed to the growth of Jewish diasporic communities around the Mediterranean and Middle East. B. The core beliefs outlined in the Sanskrit scriptures formed the basis of the Vedic religions — later known as Hinduism. These beliefs included the importance of multiple manifestations of Brahma and teachings about reincarnation, and they contributed contributed to the development of the social and political roles of a caste system. A. The core beliefs about desire, suffering, and the search for enlightenment preached by the historic Buddha and collected by his followers into sutras and other scriptures were, in part, a reaction to the Vedic beliefs and rituals dominant in South Asia. Buddhism changed over time as it spread throughout Asia — first through the support of the Mauryan Emperor Ashoka, and then through the efforts of missionaries and merchants, and the establishment of educational institutions to promote its core teachings. B. Confucianism’s core beliefs and writings originated in the writings and lessons of Confucius and were elaborated by key disciples who sought to promote social harmony by outlining proper rituals and social relationships for all people in China, including the rulers. D. Christianity, based on core beliefs about the teachings and divinity of Jesus of Nazareth as recorded by his disciples, drew on Judaism and Roman and Hellenistic influences. Despite initial Roman imperial hostility, Christianity spread through the efforts of missionaries and merchants through many parts of Afro-Eurasia, and eventually gained Roman imperial support by the time of Emperor Constantine. E. The core ideas in Greco-Roman philosophy and science emphasized logic, empirical observation, and the nature of political power and hierarchy. III. Belief systems generally reinforced existing social structures while also offering new roles and status to some men and women. For example, Confucianism emphasized filial piety, and some Buddhists and Christians practiced a monastic life. IV. Other religious and cultural traditions, including shamanism, and ancestor veneration persisted. B. 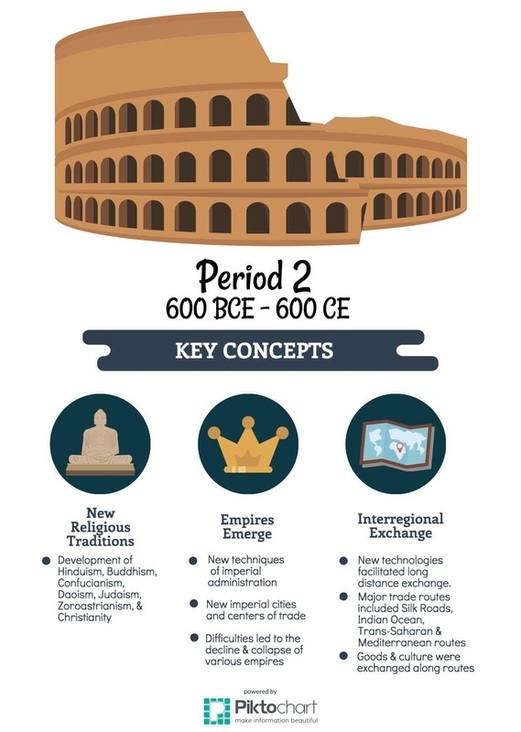 Imperial governments promoted trade and projected military power over larger areas using a variety of techniques, including issuing currencies; diplomacy; developing supply lines; building fortifications, defensive walls, and roads; and drawing new groups of military officers and soldiers from the location populations or conquered populations. A. Through excessive mobilization of resources, imperial governments generated social tensions and created economic difficulties by concentrating too much wealth in the hands of elites. With the organization of large-scale empires, the volume of long-distance trade increased dramatically. Much of this trade resulted from the demand for raw materials and luxury goods. Land and water routes linked many regions of the Eastern Hemisphere. The exchange of people, technology, religious and cultural beliefs, food crops, domesticated animals, and disease pathogens developed alongside the trade in goods across extensive networks of communication and exchange. In the Americas and Oceania localized networks developed. I. Land and water routes became the basis for ​interregional trade, communication, and exchange networks in the Eastern Hemisphere. A. New technologies permitted the use of domesticated pack animals to transport goods across longer routes. B. Innovations in maritime technologies, as well as advanced knowledge of the monsoon winds, stimulated exchanges along maritime routes from East Africa to East Asia.